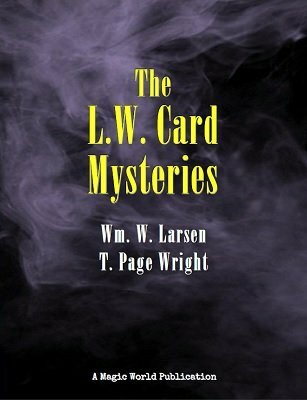 Every effect in the L. W. Card Mysteries is an apparent miracle. None of the effects requires long practice or more than a modicum of sleight of hand. Many require little skill at all. Just a rehearsal or two and you'll be all set to amaze and, most of all, entertain. You'll learn how to make two selected cards turn over in the pack without the use of skill and no false moves of any sort; to make a selected card vanish from the hands of the spectator and be found elsewhere; to make two cards change places - the positions of the cards being seen up to the moment of the change; to perform a test with cards which, if you saw anyone else do it, would lead you to believe in spirits; to name a card which has been freely selected behind the back (no forcing; the cards actually at all times behind the back; no torn corners, etc. ); how to do a baffling card discovery which may be used as a force; to make a spectator cut any color, and many more! New Card Discoveries • Effects with Prepared Cards • Novel Card Creations. In addition to the many effects originated by the authors there's also a marvelous new routine, "The Prophesied Leaper," by Jack McMillen, that will make your audiences talk about you for months to come. Forty-five pages. Enough material for a two-hour act of new tricks with cards alone. Clearly written so that anyone, even without previous experience, may read and understand. These tricks are of a kind which are usually offered only for private sale at prices ranging from a dollar to ten dollars each. And best yet, we've priced this work to become an instant best seller, affordable by most any magician. Expanded reprint of the pre-1934 second Thayer edition, includes more than twice the original number of illustrations, plus several important edits, clarifications and updates.